3 How to find out ID of another user? 4 In some cases, you may need ID? Regardless of, What social networks, and for what purposes do you use it, you may need to use your id. But before you can use, you must first get to know him. By the way, most often need to use ID occurs in Odnoklassniki users. That is why, below will provide detailed information on, how do you know your id in Odnoklassniki. The first thing to understand, that know their individual number (ID) in the social network, can only registered users. Also with the help of this particular number, you can find the right people. Quite often search issue is too big list of namesakes. And to find any game or the team will be much easier, if you know their individual unique number. You need to go to the website Classmates, get on your page. Then select any tab "Main" tab or the "My Page". Then looks up at the website address line, and write 12 figures, indicated after the slash. The second method is very similar to the first. Only in this case it is necessary to open the main page of your profile. Under the avatar has a list of the main functions available to you, among them the need to select "More" option and select it in the function "Settings". After that, the bottom of the page you will be able to see and individually numbered. Now you know, how do you know your id in Odnoklassniki. But sometimes there may be situations, when for some goals you need to know the individual number of the other user and classmates. Below you will find information, which will help you cope with this problem. How to find out ID of another user? 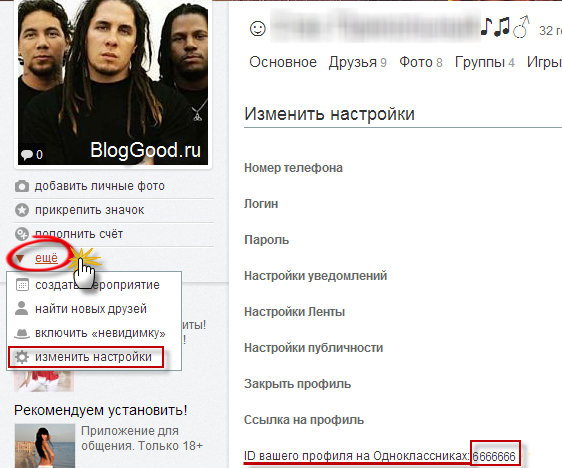 By and large, know the individual user's unique number on Odnoklassniki possible in the same way, that your own. However, some users are able to change these 12 numbers on any word or your own login. Most often do so in order to protect your account from hacking by hackers. But in this case, you can find the coveted number, and you can do it very easily. All that is needed, is to select one of the items under the main photo of the person, id number, which you need to learn and just point the cursor to it. In this case the user a unique number will be displayed at the bottom of the page. Now you know not only that, how do you know your id in Odnoklassniki, but also about, how do you know an individual number of the other person in the social network. In some cases, you may need ID? so, each person has reached 14 years of age have a passport, and nobody asks, why you need it. The same applies to the id. By and large, this is your passport system. It may be necessary not only to search for you or another person you, but also with some games or applications. Also some special craftsmen use individual numbers of other classmates for users hacking their accounts. Therefore, information on, how do you know this number should be used properly and carefully.